The RNLI Bronze Medal for Gallantry is to be presented to Exmouth crew volunteer Roger Jackson (43) following the rescue of four people from a capsized powerboat last October. At a meeting of the charity’s Trustees this week it was agreed that the award acknowledged Roger’s exemplary command and leadership, boat-handling skill and tenacity in exceptional conditions. The Thanks of the Institution inscribed on Vellum will also be presented to Exmouth crew volunteers Mark Champion (32) and Andrew Williams (32) for their role during the same incident. The story unfolded late in the afternoon on Sunday 23 October 2011 when reports came in of people in the water after a Rigid Inflatable Boat (RIB) capsized in the River Exe estuary. 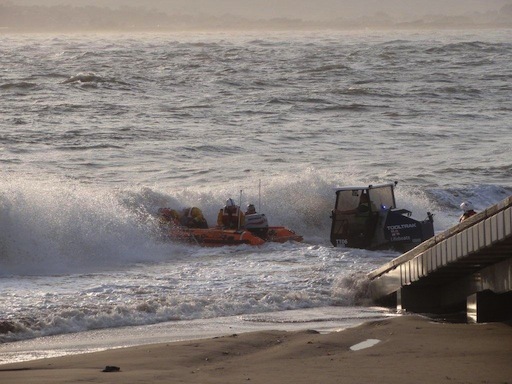 Knowing four people were in the water and in immediate danger, it was decided to launch the Exmouth RNLI D class inshore lifeboat George Bearman, despite a near gale force onshore wind from the south east. RNLI volunteers Roger Jackson (Helm), Mark Champion and Andrew Williams launched the lifeboat through surf of a metre and a half. As the three lifeboat crew reached the main part of the channel, they were immediately battling harsh conditions. At one stage they had to work hard to keep the lifeboat upright, while Roger Jackson negotiated the safest route possible, using the lifeboat’s full engine power to climb the face of very large waves. Only minutes after the launch the crew volunteers caught sight of the casualties through the wind driven spray. Three were wearing wetsuits only and one, who was fully clothed, had an inflated lifejacket on. All were clinging on to the top of the RIB and it was clear that time was of the essence. Roger Jackson immediately understood that the casualties could become separated from the boat and lost in the dangerous, confused and large seas with their chance of survival being significantly reduced. Roger Jackson noted the large amount of debris floating on the water and manoeuvred into position around 5 metres from the casualties so he could make voice contact with them. He told them to swim to the lifeboat one at a time every time he took the lifeboat past, as he was unable to maintain the lifeboat position close by and for long enough to pick everyone up at once. On each approach, Roger Jackson had to time his passes accurately so each casualty started their swim while the boats were between wave crests and so they could therefore be recovered before the next swell was reached. With his timing critical to the success of the rescue operation, Roger repeatedly turned the inshore lifeboat to run down-sea to commence each run and he and his crew recovered the casualties one at a time. The casualties were pulled from the sea into the lifeboat by crew volunteers Mark Champion and Andrew Williams who had each time, to immediately revert to the job of keeping the lifeboat trimmed (this is where the crew use their weight to keep the lifeboat stable and upright). All four of the people rescued were very shaken and cold, but otherwise alright. Roger realised that trying to recover the lifeboat back onto its trolley would be extremely hazardous in the prevailing conditions so he elected to beach the lifeboat high onto the sand so the casualties could be treated ashore by paramedics. This was achieved just 24 minutes after the lifeboat had first launched. Roger Jackson subsequently applauded his crew for their tenacity and teamwork and praised the RNLI training they had all received, which he said made the service possible. He also praised the D class inshore lifeboat for its performance under immensely difficult conditions. ‘Roger Jackson displayed an exceptional level of courage, determination, leadership and boat-handling skill in a highly demanding environment. Faced with incredible pressure to achieve the rescue with very little margin for error, he nevertheless held his composure and carried out a successful rescue. His skill, tenacity and decisiveness under pressure ensured the timely rescue of all four casualties. His impressive boat-handling skills under such exceptional circumstances are particularly worthy of note. The RNLI Medals for Gallantry are presented to recipients at the charity’s Annual Presentation of Awards at the Barbican in London in May of each year. The Thanks of the Institution inscribed on Vellum are usually presented locally at a time and date to suit the lifeboat station team. No date has yet been set for the presentation at Exmouth.